Stiller and Wilson combine again, but without the spark of Zoolander. Based on the television program of the 70s, this film version of Starsky & Hutch, whilst promising much, fails to deliver. The recent trend to remake old tv shows shows no sign of abating, with I Dream of Jeannie and Bewitched coming soon, and Charlie’s Angels the most well known example. While these new versions often deliver a comedic touch in a harmless spoof on the original, this film seems to be caught in between being a serious new take on the tv classic or a playful comedy with bad clothes. The basic story of two mismatched cops joining forces to take on crime and eventually find they’re not so dissimilar after all, is not the problem. The story is not challenging or difficult, and a lighter approach could have made this fun. The main problem is the failure to stand as either a comedy or an action film, with a bad mix of the two being achieved. Sure, many films have action and comedy together, but this one takes itself way too seriously to be enjoyable. If only the director could have better utilised the obvious comic abilities of Stiller and Wilson. In fact, the lead duo is really all there is going for this. 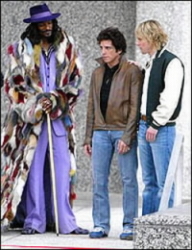 Snoop does a good job of a limited role, but I think we would all agree we could have seen more of him. The female interests, whilst attractive, offer very little to the story, and the other cops even less. Chris Penn is awful in his small role, and the remaining cast are forgettable. Vince Vaughn is mysteriously poor as the bad guy. Perhaps with a stronger presence as the nemesis, this film would have been more enjoyable. Stiller does Stiller, and Wilson does Wilson. I wondered at one stage how it would have been to have had Stiller play Wilson’s style and Wilson, Stiller’s. Probably more interesting for us, and definitely more challenging for them. There are times it seems the stars are bored, and certainly I was. Starsky & Hutch fails in many areas, but it does have some worthwhile parts. There are some good lines, the car is great and Snoop is fun. The dance-off scene is amusing, albeit a rather heavy-handed homage to the dance-off scene in Zoolander. Add the cameo performances of Paul Michael Glaser and David Soul as the original Starsky and Hutchinson, and this film may leave a smile on your face. Whether it offers anything of long-term value remains to be seen, although I suspect not. This entry was posted in Film Reviews and tagged Comedy by Mark Lavercombe. Bookmark the permalink. Ugh! I’m not going to spend much time rambling on about this film. I walked out of the room to answer a phone call about twenty minutes before the end, and when I returned it had finished. The sad thing is that I didn’t really care that I’d missed it. That and the fact that when I asked what happened, everyone else said ‘you didn’t miss much’. Starsky And Hutch is a big waste of time. It’s not really funny (I was with a bunch of dudes and we only laughed maybe once every ten minutes) and is the ultimate in ‘let’s remake it for the sake of remaking it’. Admittedly I’ve never seen the television series, so maybe I was missing something. But it was hard to distinguish between what was supposed to be wacky, what was supposed to be funny, and what was supposed to be retro. Stiller and Wilson can be funny guys, but there’s no point if the script is a dud. 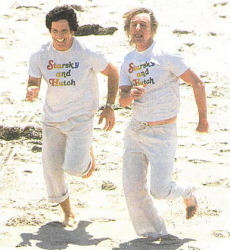 Starsky And Hutch is an absolute indulgence on their part. Just about the only thing worth seeing is Snoop Dogg, who’s always fun to watch. He’s playing a nice guy here for a change (as opposed to Bones, and most hip hop movie roles), and he seems to treat his role far more seriously than anyone else. I simply didn’t care about this film. I wasn’t even really conscious of why they were going about their police business the way they did. The plot was merely a means of getting from one set piece to another. I’m so sick of remakes. Really. What’s the point?